Bungee Pull 4-Person Interactive – Competitive games that ignite the fire in your soul, the energy running through your muscles and the focus of your mind can elevate any party of all ages instantaneously. That's why the About to Bounce Bungee Pull for Person Interactive is the perfect game for any party. The About to Bounce Bungee Pull 4 Person Interactive is a four-person game where each contestant has a bungee cord attached to a secure harness on their back. Basketball in hand, it's a race to see who can push themselves to the limit and become the first player to dunk the ball at the end of their ramp. Imagine hearing the cheers of joy as your guests watch as their friends race against an enormous weight and force behind them. The Bungee Pull for Person Interactive is perfect for children's birthday parties and other social events. 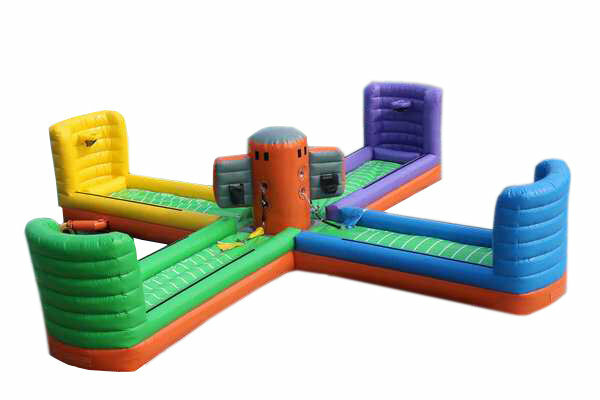 Priced at $299.99 for a six hour rental, this is one competitive environment that is sure to be a slam dunk.